The Dow Jones today continues to move higher as a sudden increase in U.S. bond yields overshadows yesterday's concerns about whether China would continue buying U.S. debt. The Night Trader's Secret: A former Wall Street insider just revealed a new strategy for executing night trades that could set you up for potential $850, $2,250, or $6,775 paydays – overnight. Click here. Gold prices ticked higher this morning thanks to a retreat in the U.S. dollar. Yesterday, gold showed solid gains on reports that China may consider a plan to halt purchases of U.S. Treasury bills. That news sent bond prices higher and drove traders into safe-haven assets. With China among the many geopolitical threats that are mounting around the globe, right now is the ideal time to own gold. Don't make the mistake of waiting until after it rallies big gains to get in. Here's how to buy gold, before it packs on more gains. Oprah Winfrey could be running for president of the United States in 2020. According to a new Rasmussen poll (perhaps the most pro-Trump polling group out there today), Winfrey has a 10-point advantage on U.S. President Donald Trump. Based on historical data related to other polling divisions, it's possible that favorability and preference are much higher in Winfrey's favor. The investment world is already thinking about what Berkshire Hathaway Inc. (NYSE: BRK.A) will be without its legendary founder, Warren Buffett. 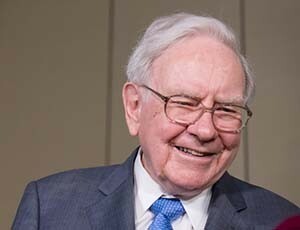 According to reports, the company is starting to prepare for life after Buffett, who is now worth a stunning $87 billion. The company is now worth more than $500 billion and will hugely benefit from the recent tax reform. Many anticipate that either Greg Abel, CEO of Berkshire Hathaway Energy Co., or Ajit Jain, executive vice president of Berkshire Hathaway's National Indemnity Co., will be take the throne. But many questions remain, and investors will likely start to ask them in the months ahead. The price of Ripple is in a free fall. The cryptocurrency has plunged by more than 55% as investors headed for the exits just days after it hit a record $3.84. But the real news is that Bitcoin prices plunged yet another 9% thanks to news that South Korea is preparing a ban on trading the cryptocurrency in the country. The news also fueled a sharp sell-off in Ethereum, which fell by more than 10% on the news. About one-tenth of Ethereum traded around the world is done so in South Korea. Shares of Delta Air Lines Inc. (NYSE: DAL) are on the move this morning after the global airline giant announced quarterly earnings before the bell. Wall Street had expected earnings per share of $0.89 on top of $10.16 billion in revenue. Tesla Inc. (Nasdaq: TSLA) received a huge boost of confidence Wednesday after receiving a strong upgrade from Evercore. The investment firm says that if you're serious about ever buying TSLA stock, "now's the time." The stock is off to a very strong start in 2018 despite last month's week report on vehicle deliveries. Exxon Mobil Corp. (NYSE: XOM) has a new battle to face in the court room. The City of New York has launched a climate change lawsuit and threatened to sell billions of dollars in stocks tied to the energy business. New York is the first city to sue Big Oil companies. Defendants include ExxonMobil, Chevron Corp. (NYSE: CVX), BP Plc. (NYSE: BP), Royal Dutch Shell Plc. (NYSE: RDS), and ConocoPhillips (NYSE: COP). The city is demanding that these oil companies protect the city from the "existential threat" of climate change. Look for additional earnings reports from Shaw Communications Inc. (NYSE: SJR) and RE/MAX Holdings Inc. (Nasdaq: RMAX). New York Federal Reserve Bank President William Dudley speaks at 3:30 p.m.